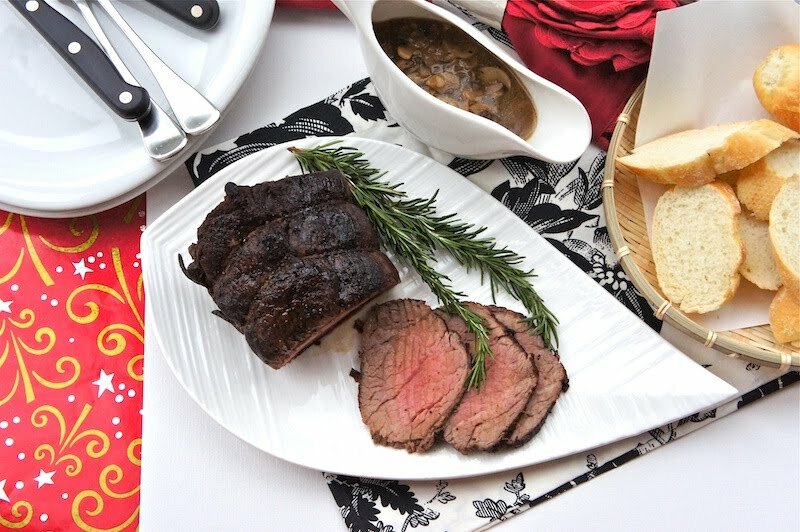 At a Christmas party recently, I really enjoyed the way my friend prepared her roast beef tenderloin, which was served with an array of sauce and bread. Guests sliced their own roast beef and enjoyed it with the sauce of their choice. 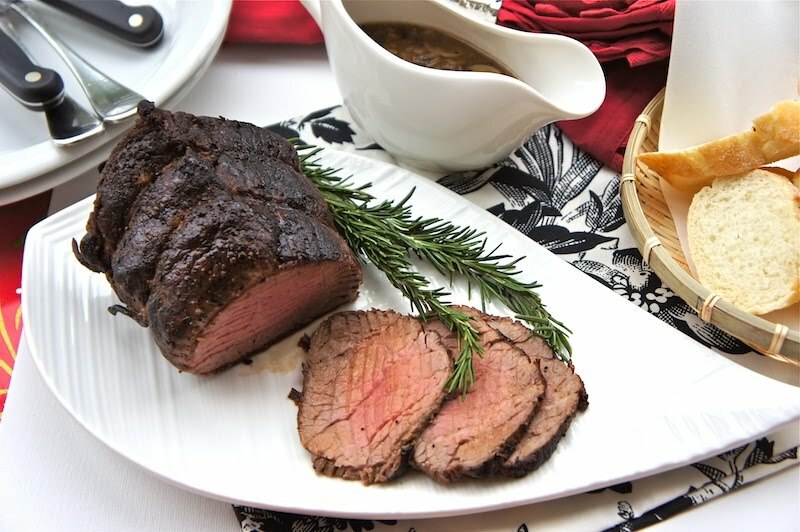 I thought it was a nice way to served Roast Beef Tenderloin at parties or gatherings. Get your guests to feel more casual, relaxed, and more at ease. Using kitchen string/twine and tie around the tenderloin with equal spacing between each truss. Note: You can ask your butcher to do this for you. Pat dry the beef tenderloin with paper towels. Rub the tenderloin with olive oil and sprinkle with black pepper, sea salt, and rosemary all over the meat. Heat a large cast iron pan over high heat and sear the meat on all sides until brown in color. Place the meat in a baking tray and roast for about 20 to 40 minutes or cooked to your liking. When the tenderloin is cooked, remove from the oven, cover loosely with aluminum foil and let rest for about 15 minutes before serving. love your photos! what a perfect Christmas dinner dish! Oh, how fun to get to slice your own roast and then select a sauce! I agree, that totally makes it more casual and fun. This dish looks lovely and I would love to have something like this be the star of our Christmas dinner. This looks divine! I can't wait to try this... my hubby will LOVE it! OMG, I WANT that plate. Gorgeous gorgeous. It looks to die for. Oh, yummy!! It looks really nice, and when I'll get my oven fixed, I'm surely making this!! What kind of sauces did your friend serve it with? @Angela:She served the roast beef with black peppercorn sauce, mustard, cream, and fruity chutney. Add mushrooms and cook for another 5 minutes, mix in the flour and stir until well mixed. Turn the heat on high, pour in the wine, beef broth, black pepper, and season with sea salt. Bring it to a boil and reduce the heat. Let it simmer for about 8 to 10 minutes. Add 1 Tbsp of butter or cream just before serving, if desired. That looks simply beautiful. I love a great looking piece of beef.